The support grid is a self supporting filtration structure which retains the active media. Each component of the structure is designed to resist temperature and pressure and may include additional beams. Deflection of wires and support rods is important as well as appropriate fixing devices. 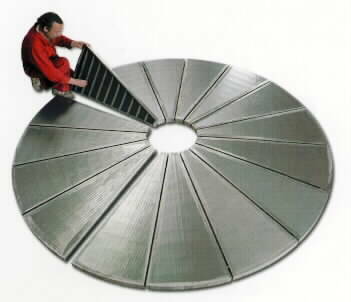 Support grids can be supplied out of parallel or pie-shaped segments.The joining bars can be flush or project above the screening surface. Support grids are manufactured to meet international standards and can resist high pressures, temperatures and stresses.